Engineers Labor-Employers Cooperative for Sweeney! 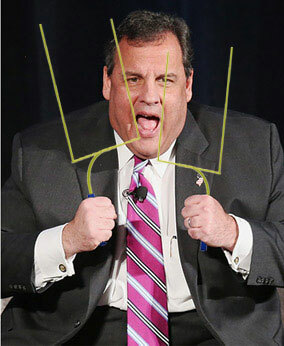 Governor Christie is trying to move the goalposts again. Don’t let him. Practically the only success of this Governor has been his ability to develop and disseminate messaging that deflects blame. He’s trying to do it again here. Did you catch what he did? Four years after proudly exclaiming that our pension problems were fixed by his bipartisan solution, he is moving the goalposts so others attempting to measure his performance can’t use the same easy metrics he used. Amazingly, six years into his tenure, he is deflecting personal blame onto his predecessors. Six Years! It was only 100 days before Obama’s critics began screaming that he needs to own up to the problem and stop blaming his past. But Christie wants patience and forgiveness through 70% of his tenure. And his shift here is attempting to completely distract from the real problems he refuses to acknowledge. Christie’s past has introduced budget problems for which there are no easy answers. We’ve known that since before he was elected in 2009. But that is not where Christie deserves criticism. This new message of “blame the past, not me,” allows him to pivot away from very real and measurable problems of the policies he chooses to implement. 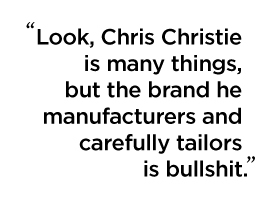 Remember the David Wildstein that Governor Christie barely knew? Remember when Christie claimed he barely knew David Wildstein? Turns out he shared his first beer with him when Christie was 14. I dunno about you, but I didn’t engage in illegal underage drinking with people I don’t trust. And I certainly remember the people I drank my first beer with and share a unique bond with them that transcends the term acquaintance. Either Christie has a weird definition of friend/acquintance, or he’s been caught in another tall tale of his. Though, when you call the King of Solomon you just spent 3 days with your friend, perhaps Christie measures relationships by wallet size. Like what I have to say? Follow me on twitter @jwitherspoonNJ. Governor Christie, our Governor who thought New Jerseyans wouldn’t mind him being constantly out of the state while he lays the groundwork for his 2016 Presidential run, found out, yet again, that just because he wills something doesn’t mean it comes true. This week, a Quinnipiac University poll found that Christie’s approval ratings have fallen to their worst since early 2010, with 48% disapproving of his performance and only 46% approving. Listen up Americans. I didn’t invite the national press for nothing. This speech is for you. New Jersey is quickly growing tired of me and so I need a new audience. The state of our state continues to get better. New Jersey is better off than it was last year at this time, and it is certainly far better off than it was just five years ago. While many first years of a second term show a hangover from the campaign and its partisanship, we have fought through that tradition and have real accomplishments to show for that action in 2014. Ignore that line I made a couple years back about the New Jersey Comeback™. Our economy lags behind our neighbors and by multiple accounts is still in relatively bad shape. Let’s do everything I can to spin this. This is a tale of two New Jerseys. Prior to coming to power, those living under the poverty line in New Jersey was below 9%. Yet in 2013, it rose to over 11%, only one of three states in the nation where poverty has increased(New Mexico and Washington happen to be the others). But while my administration has worked hard to cut funding to needy school districts, prevent healthcare expansion under the Affordable Care Act, and cut property tax rebates, it has done an incredible job at providing corporate welfare to keep the rich safe and happy. In a year with plenty of politics from some overly partisan corners of this chamber, New Jersey has made progress — growing our economy, creating jobs, reforming our criminal justice system, and improving some of our most challenged cities-like Camden. We’ve done it because a majority of us care more about our state and New Jersey’s middle class than we do about scoring partisan political points. I must be careful to follow up buzzwords like “Camden” and “middle class” that hints to my audience thinks I’m a governor of the people with explanations of how helping the rich and big corporations is really about helping them. Because, the rich are good, caring, generous, job-producing, people. Since last January, the total number of people employed in New Jersey has grown by over 90,000, and the number of unemployed has dropped by nearly 30,000. We recorded our 5th consecutive year of private sector job growth, and the unemployment rate continues to steadily go down. Despite constant criticism of policies from politicians on the other side of the aisle, my State’s unemployment of 6.4% continues to lag behind the national average of 5.8% by a significant margin. And while the United States has fully recovered the jobs lost from the Great Recession and Democratic New York has regained 200% of the jobs lost since then, New Jersey has only returned 50% of those jobs. This has resulted in New Jersey being left with the highest rate of long-term unemployment. We have attracted and retained companies — from Subaru USA to the Philadelphia 76ers to Sandoz. We have grown our economy and more people are working, supporting their families and knowing the power of going to work every day in New Jersey today than one year ago. We’re really skilled at giving out checks to corporate donors looking for a break. My administration gave out $82 million to the 76ers to create 250 jobs ($328,000/job), $118 million to Subaru USA to promise 100 jobs ($1.18 million/job), and offered $9.1 million to Sandoz, Inc. to stay in New Jersey to keep nearly 300 jobs and add 70 ($24,267/job, or $130,000/new job). These examples are only a small portion of more than $4 billion my Administration has committed to helping out my rich friends saving the middle class. We have done this while holding the line on government spending and government employment. We also extended the successful cap on a key driver of property tax growth. I’m personally proud of my record of corporate welfare that only temporarily keeps companies and jobs within this state while at the same time cutting funding to many of the infrastructure necessities (including public trusts as well as research that supports public-private partnerships (and spurs innovative and economic output). I’ve retained a couple hundred jobs here, a couple hundred there, while failing to address major macroeconomic challenges such as our foreclosure problem that continues to plague our economy, with nearly 8% of mortgages in foreclosure compared to approximately 2.5% nationally. Now, despite this progress, Despite so much evidence of an improving New Jersey, It has become fashionable in some quarters to run down our state. I get it: that’s politics. I don’t tolerate criticism. As long as I believe I’ve made a difference, it shouldn’t matter if there is genuine criticism or overlooked failings. But let’s be clear. Our growth in this past year has been part of a trend. A trend that began five years ago. It is easy to forget where we were and how far we have come. Five years ago, our unemployment rate was 9.7%. Over 440,000 New Jerseyans were out of work. Today, the unemployment rate is 6.4%. We have cut unemployment by over one third in the last 5 years. And we have created over 150,000 private sector jobs in New Jersey in five short years. Please pay no attention to the stats that suggest we’re behind the curve compared to others. Let’s not talk about that. Let’s celebrate our moderate successes instead! Five years ago, we faced massive consecutive budget deficits –$2 billion for fiscal year 2010 and a projected $11 billion the next year, on a budget of only $29 billion. We fixed it by making hard choices; the way middle class families in New Jersey have to do it in their homes. Today, we have balanced five budgets in a row. And we will balance a sixth this year. And we didn’t do it the Washington way, by raising taxes. Balancing the budget is the new smoke-and-mirrors way of suggesting my governship has not dealt with similar structural deficits each year. That way I can claim I’m making tough choices each year when I refuse to meet certain budgetary obligations. We did it by cutting spending, shrinking government, and fundamentally reforming the way government operates. This administration believes today — and has always believed — that New Jersey and America, will be a better place for middle class families by shrinking the size of government. I cut spending and shrank the government so I didn’t have to raise taxes on the rich who have been paying less for years. Because helping the rich will only help the rich middle class. Back then, state spending had grown by 56% in the years from 2001 to 2008. Today discretionary spending in our state’s budget is $2.5 billion below its level in fiscal year 2008. Back then, the size of government was out of control. Today, the number of state government employees is 6,000 lower than it was five years ago. Having 6,000 fewer jobs for state workers has really stopped our state from being out of control. Who cares if the cuts to spending disproportionately affect the middle class and the working poor? The rich will help the middle class recover all those jobs we haven’t yet recuperated from our infrastructure spending cuts. Back then, New Jersey’s highest in the nation property taxes had increased more than 70% in ten years. We averaged a 7% growth in property taxes per year. Today, we have had four years of less than 2% annual property tax growth. Now it’s because of the property tax cap we passed together in 2011 is working. This is a bipartisan achievement. Today, New Jersey still has the highest property taxes in the nation and because I’ve cut property tax rebates for those making less than $150,000/yr., this class has seen their net property taxes rise 18.6% per year. And my 2% tax cap has saddled municipalities with fiscal challenges in order to bail out Trenton. What’s with this obsession on Governor Christie’s sport’s preferences? Easy: Governor Christie and his strategists understand the way the present day media works better that nearly any politician today. He understands that watching the news today means learning pretty much nothing about what is going on locally, nationally, or internationally. He understands that the stories easiest to grasp and easiest to form an opinion about are the ones that make the lede and the ones that sell copy. He understands that the more complex, muddied up, or grey-zoned a particular story is, the quicker people tune out. Appearing on NJTV’s with Steve Abubato last night, Governor Chris Christie answered one question in particular without the usual partisan cheapshot. It was refreshing to hear the Governor speak without the audacious and vilifying tone that most in the state have grown tired of. The answer was in response to a question posed (10:35 mark) by Mr. Abubato in regards to comments made by partisans suggesting prominent activists have created an environment that encourages and propagates violence against police officers that results in things like the murder of two Brooklyn police officers by a deranged and suicidal gunman. One of the things that disturbs me about the entire conversation that we’re having right now is it seems like lots of people are trying to score political points here,” Christie said when asked about the same issue. “And, what I’m thinking about as we sit three days away from Christmas, are those two families of those two police officers who will not have them at their dinner tables at Christmas time, who won’t have them there to open up present under the Christmas tree, who will not have them, not only this Christmas, but every Christmas going forward. And I think before we get into that analysis, it may be time for everybody in this region and around this country to take a deep breath and to think about the loss that’s been suffered by these two families. Despite differences between left and right, the Governor changed pace by using this opportunity to transcend partisan divide and request that we focus on what truly matters: life, family, and respect. While some may consider this site partisan, I think it’s better to describe it as political. We applaud messages and policy we feel are right and just-not simply by our political allies. Chris Christie’s thoughtfulness is correct here and deserves praise. However, despite the Governor’s thoughtful and kind remarks on the issue, I wish the Governor would have went further and offered the eloquence penned by Kareem Abdul-Jabbar in Time on Monday.